Is the son of the late James Clark, a well-known yachtsman on the Clyde, where the name of Clark is a house­hold word. Few families have been such enthusiastic yachtsmen, and owned so many yachts, and Mr. Kenneth M. Clark is uphold­ing that tradition. 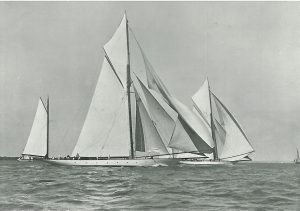 He commenced in 1883 with the Watson 15-footer Corette, a deep-keel boat, in which he won twelve prizes in her first season. He then owned the Nellie, de­signed by Fife, junior, which won seventeen firsts and one second out of eighteen starts, followed by Nellietoo, 17-19 foot Clyde class, which finished top of her class the first season. He owned the two Lalas, 19-23 foot Clyde class, and Encore, 10-rater, in partnership with his brothers James and Norman; the Encore was top of her class the first year; then Thella, 19-23 foot; and in 1900 Khama, 65-rater, by Fife. This was a fast boat, but there were no new competitors against her. In 1901 Mr. Kenneth Clark bought Kariad off the stocks, and had a most successful time, winning in the Mediterranean twenty-one firsts in twenty-three starts against the Sybarita. Mr. Clark owned five Katoombas, steam yachts, in partner­ship with his brother, and has since his brother’s death built two steam yachts to which he gave the same name, one of 520 tons and one of 820 tons. Mr. Clark’s present yacht is The Ketch, a ketch of 110 tons Thames measurement, with twin motors—an unusual feature in auxiliary vessels, but one which has since been imitated. The Ketch attains a speed of seven knots. He is a member of the Yacht Racing Association. Clubs: Royal Thames, Royal Northern, Royal Corinthian, Royal Victoria, Royal Harwich, Clyde Corin­thian.